An efficient pencil grasp is one that allows the child to write neatly at a reasonable speed without tiring easily. Poor pencil grasps not only look awkward but they do not use the hand muscles efficiently. 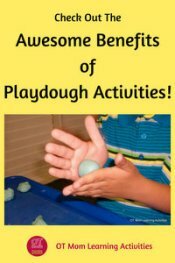 This may result in the child tiring easily and being unable to produce neat handwriting. 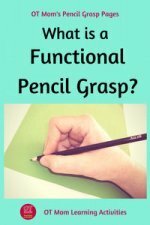 How important is the pencil grasp for handwriting? 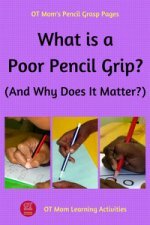 What is a poor pencil grip? How can I help my child develop a good pencil grip? Should I correct my child's weird grasp? There are a few stages of development that most children go through as they learn to master the use of a crayon or pencil. These stages usually correspond to an increase in postural stability, strengthening of the core and shoulder muscles, and increasing dexterity of the wrist, hand and finger muscles. In other words, as your child's body matures and strengthens, so the way your child grasps a crayon will develop and mature. It is really important that you understand the basic developmental stages of holding a pencil and not force your toddler to use a grasp that he/she is not yet ready for. You would not expect your toddler to walk and run and skip like a 6 year old, so why expect your toddler to hold a pencil like a 6-year old? Their little bodies need to mature in all kinds of ways in order to develop a mature pencil grasp at the right time. 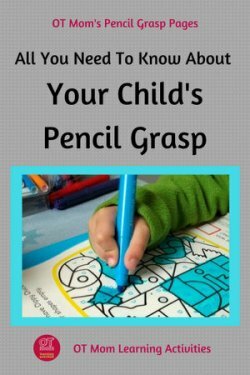 Usually, given normal play and development opportunities (lots of preparatory skills like cutting etc), by the time your child is 5-6 years old, he/she will have the correct pencil grip needed for handwriting. But if we force the "correct grip" before the muscles are developmentally ready to control the pencil in that way, we run the risk of awkward pencil grasps emerging. When a child’s handwriting is poor, the pencil grip may be the first thing that the teacher notices. However, there are many different factors affecting handwriting, and a poor pencil grip may be just one factor that affects the handwriting. Studies have shown that dexterity of hand and finger muscles has a big influence on handwriting ability (along with good visual-motor integration skills). The pencil grip is therefore important inasmuch as it allows the child to use the fingers freely or not. When the fingers can move freely with the correct amount of control, the pencil can be turned and manipulated to form the different letters accurately. If your child has a reasonably efficient pencil grasp, but still struggles with handwriting, perhaps rather concentrate on improving visual-motor integration skills for flow and legibility of letter formations. To view some of the pencil grips that are considered to be the most functional, pop over to my page on Efficient Pencil Grasps. If your child’s pencil grip blocks finger movements, it may cause unnecessary fatigue, discomfort and messy work. This in turn may affect handwriting, because the child will be using the wrist and arm muscles to move the pencil and form letters. 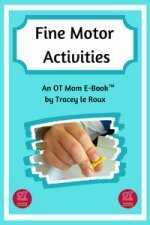 A poor pencil grip may be the red flag that a teacher uses to send a child for an occupational therapy evaluation, but a good OT will assess all the different factors that are possibly influencing your child’s handwriting. The pencil grip alone is not usually the cause of the poor handwriting. 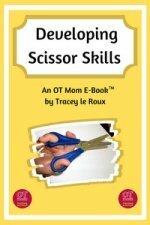 A poor pencil grip is often compensating for other skills that are missing or weak, and an OT will be able to see what skills need to be worked on. Check out my page of Poor Pencil Grips for more information and pics. A poor pencil grip together with messy handwriting can be a symptom of dyslexia. This link goes to an article on the Dyslexia website. Contrary to popular opinion, pencil-and-paper activities are NOT the best way to help your child develop a good pencil grasp! Learning to hold and use a pencil or crayon does not develop in isolation from other fine motor skills. 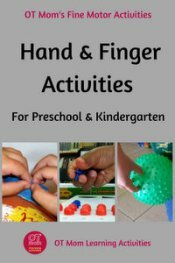 There are a number of underlying foundations that can help your child develop good fine motor skills. 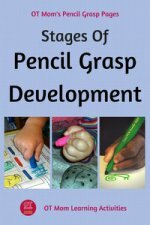 If you make sure that your child is developing all these underlying skills, then you are helping your child have a good chance at developing a functional, efficient pencil grasp. A functional pencil grip will allow hand and finger muscles to move freely (although some grips are better at this than others), which can help your child's handwriting skills. 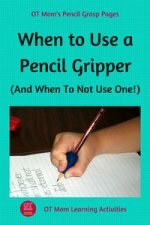 If your child has a poor pencil grip that affects handwriting and work completion, then just telling your child to “hold the pencil better” is NOT going to help! 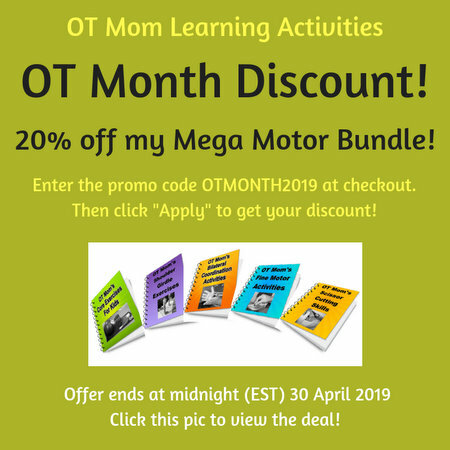 I recommend an occupational therapy assessment to help figure out WHY your child is holding the pencil so badly, and then you and the OT can make a plan to work on the skills that are missing. If your child has a weird pencil grip, but currently seems to be keeping up with classwork, and has neat handwriting, then my recommendation is that you keep a careful eye out for hand fatigue and deteriorating work (especially as the writing load increases). 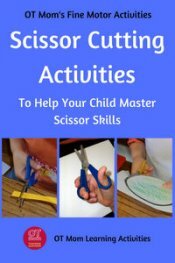 To counteract fatigue, help your child to work on hand and finger strength and dexterity. If you have been working on hand and finger strength, you can then try out a variety of pencils and pencil grippers to try and increase your child's comfort while writing. Check out the variety of different writing implements pictured above over at PFOT (this is an affiliate link). Let your child experiment with different options to find something that is comfortable and reduces fatigue. Many children and even adults, can find that a thick or shaped pen or pencil helps them control the pencil better. Experiment and find out what helps your child. I review some of the pencil grips on this page of my site. But please, if you are in any way concerned about your child's pencil grip, get a professional opinion. The information on this page does not constitute therapy! Thanks for visiting! I hope you were helped! Why not sign up for my newsletter to keep in touch with new pages and activities on my site? 3. Selin, A-S. Pencil Grip: A Descriptive Model And 4 Empirical Studies (dissertation). Abo Akademi University Press, 2003.